The main guest bedrooms at Highclere Castle are arranged around the Gallery. After the Second World War, there were really only two paint colours that were produced in any quantity: a shiny cream and a shiny green. 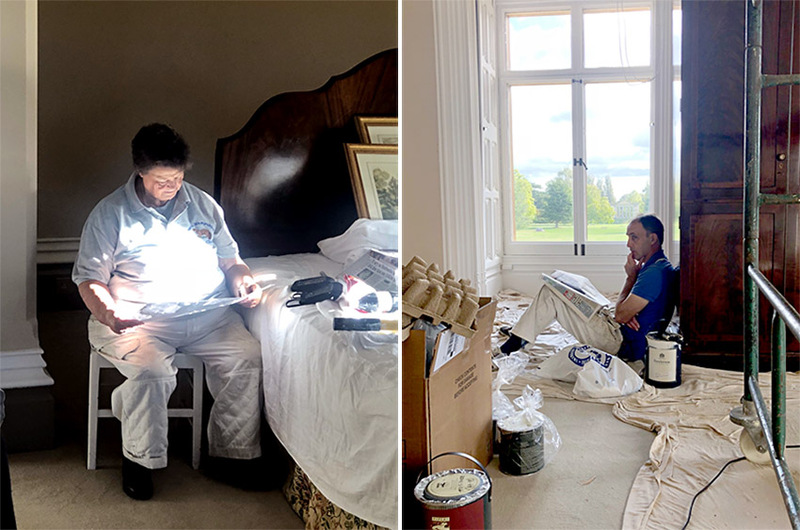 Pat Withers, who has been decorating at the Castle since the 1950’s and now heads the decorating team, has recalled to me that she and her father were just told to paint a bedroom, no detailed colour scheme specified. Thus the skirtings, ceiling, doors, walls and cornices were all either all green or all cream. Over the last fifteen years we have transformed the bedrooms – the green ones had to go first as I thought anyone who woke up with even a fractional hangover and saw the green walls might feel rather ill, and then the peeling cream bedrooms have found their themes and identity again. 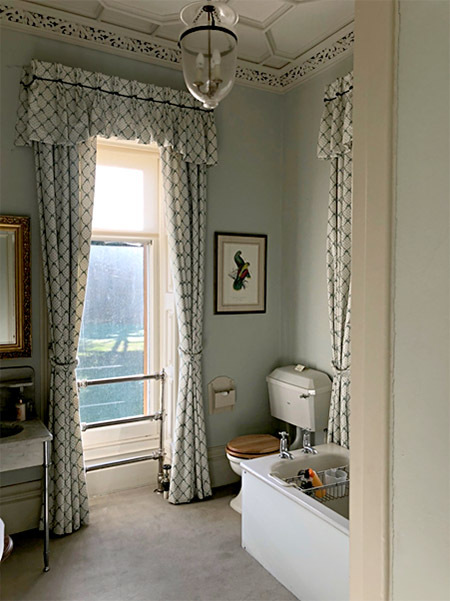 East Anglia bedroom lies in a corner with stunning views to the south and east, a dressing room to one side and a bathroom in a corner turret. The curtains are pretty but the walls an indifferent, insipid cream. It has troubled me for some time but it was not a disaster so there it stayed. After our “Heroes” weekend, however, I decided to do something fun and that it would be East Anglia. Pat then rather briskly told me she was off on holiday and rather soon. Before she had finished speaking, I rang Sarah Morris, a girlfriend who has an excellent eye and an interior design business, and within two hours the colours were chosen. Triumphantly I returned to Pat with a plan. The wall colour is called Archive, one I have used on the top floor and one Sarah thinks would be perfect for the Robing Room (yet to be started). Pat set up ladders, called in Campbell to help, sent young Richard up on the scaffold and within a day the room began to have depth and look more sophisticated. 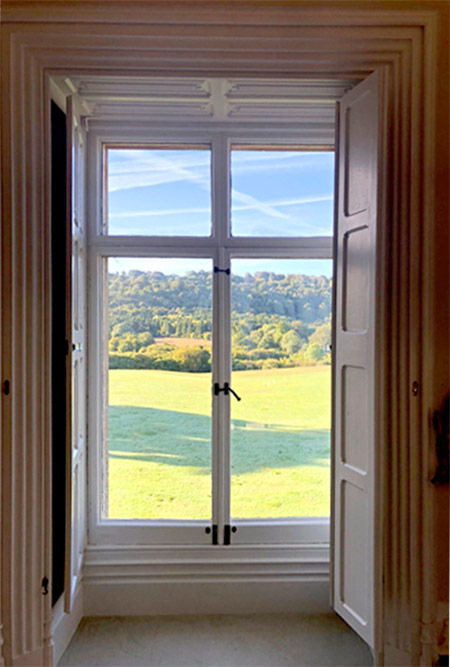 The Charles Barry linenfold doors, windows and earlier 18th century ceilings were a more complex painting scheme, involving a total of seven different colours of off-white. Pat rose to the challenge, although they needed an endless supply of tea and biscuits. I spent my time teasing Pat about how she is now painting everything properly, remembering to duck before I get spattered by a grinning and very special lady. Pat, her husband Mike and her team do not have to accept projects here but I feel honoured they carry on and so I carry on too. They have a tremendous knowledge and pride in all they do. I have learnt a lot from them. The fun thing in life is not just having an idea but actually carrying it out. Pat and I have worked our way round so much of the Castle, painting ceilings last touched 100 years ago, breathing life into bedrooms, creating havens for peaceful coherence and sleep. We have hung pictures, mirrors and lamps, painted window frames, tables, tearooms and chairs. About three years ago I stood with Pat at the foot of the first staircase leading to the great tower rising above the second floor of the Castle created by the architect Sir Charles Barry’s in about 1855. I wanted to bring it into the Castle again, connect it and celebrate the architecture. In conjunction with Sarah Morris and her team we created a wallpaper and I think both Pat and I felt near to tears. We had worked so hard and done so much and now here we were. Pat said she did not expect to ever work up here again but we had made it. Naturally my husband was not quite aware of the Tower project, nor do I think he has spotted East Anglia is underway. It does make it easier as, if he does not know, then there is no need to discuss budgets and, if there is no budget, I cannot go beyond it. I think many budgets are exceeded but in this case the budget and the bills are one and the same total. Thus I am on budget. In any case when, or if, he does notice, I am sure he will be thrilled. I do enjoy reading your blogs and they are always most interesting. We were fortunate earlier this year to have a tour around the Castle which was fascinating. You’ll have to come back and see the newly restored rooms. I love the colors . I have never left a comment before. I love your home.I also loved the entire series. I watch it whenever I want because I have all of the DVD sets. I applaud your logic to achieve it. I hadn’t thought about the Champagne – what a good idea!! It must be thrilling to be able to be creative in such a stunning place and I am sure that your husband will not mind the expenditure on keeping such a fabulous home in the great condition that you and the teams do! Would you mind saying what brand of paints you are using at Highclere? Your mention of the color “Archive” made me wonder. Thank you! The rooms look beautiful! Both Archive and Crag Grey (the skirting) are Farrow and Ball. The Cornices, Panels, Stiles and Rails, Mouldings and Fields are all Sanderson Spectrum in the Birch White range. What an amazing project! Beautiful craftsmanship and attention to detail. And the fact you’re on budget – admirable. But doing it all, so to speak, behind your husband’s back (which cannot be all that simple even in a house as big as Highclere!) to surprise him in such a marvelous way – this does undoubtedly grant you the first prize in inventiveness, good planning and determination! Best wishes from Sweden. What an undertaking. I love the choice of colors and the wallpaper. The stairway looks very bright and appealing. Good job. Well done! The result is absolutely beautiful. As colors and styles of decorating change over the decades, you have created an elegant and wonderful freshness to the bedrooms and wandering staircase. Painting and papering can create mess and disruption, but the end result is so very worth it!! I love the wallpaper and the warmth it imparts to the walls of the stairs….and the carpet gives it a warm, cozy feel. And the bonus of being “on budget” is terrific. Thank you for the photographs…..you inspire me to get going on some projects in my own home!! The season has changed, and there is a distinct chill in the morning air. Enjoy all that Fall will bring. The air has changed – rather nice and crisp today with glorious sunshine! I enjoyed the project update. The wallpaper is lovely. Thank you again for another story of life at Highclere. You always make it look so easy. The rooms look lovely, lots of hard work paid off. Budget? I’m sure you were right on. A friend of mine did not give his wife a budget for a massive renovation of their new home He tells me that she exceeded it anyway. Thank you for sharing this wonderful news of another room redone. The wallpaper is stunning and bright. 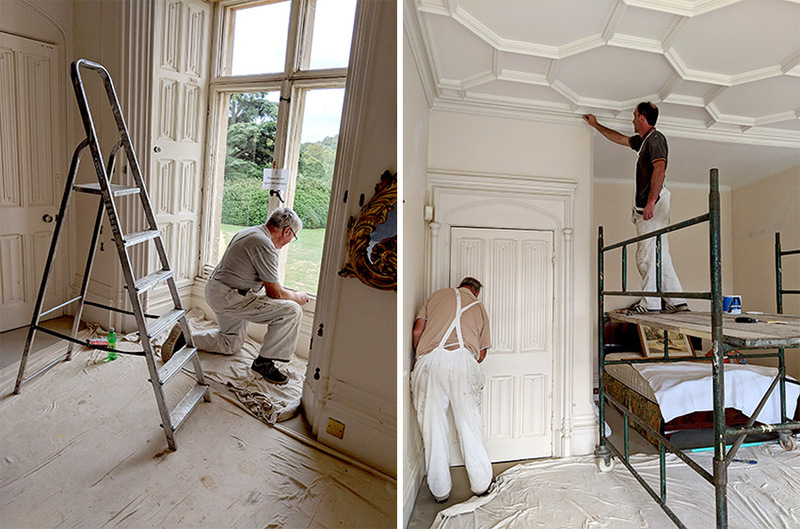 What a fantastic project, I hope one day ALL the rooms of Highclere will be restored, painted in subtle to brilliant color schemes, and just all come “alive” once again. I love “names” for paint like “Archive” and “Crag Grey”, Birch White…instead of just white, off-white, cream, light cream, etc. ‘Makes decorating a room so creative and poetic…Pat is a poet! Thank you for this very nice blog, gives me some inspiration as I look around my front room, hmmmm. It is poetic and I suspect makes me buy more paint and experiment! I visited Highclere in 2016 and every time I read your blog I feel the need to re-visit and catch up on all the changes—much like visiting an old friend. Thank you for sharing this wonderful place with us and all the wonderful people who work with you. Your humor and insight make marvelous stories! Hoping to visit again soon. 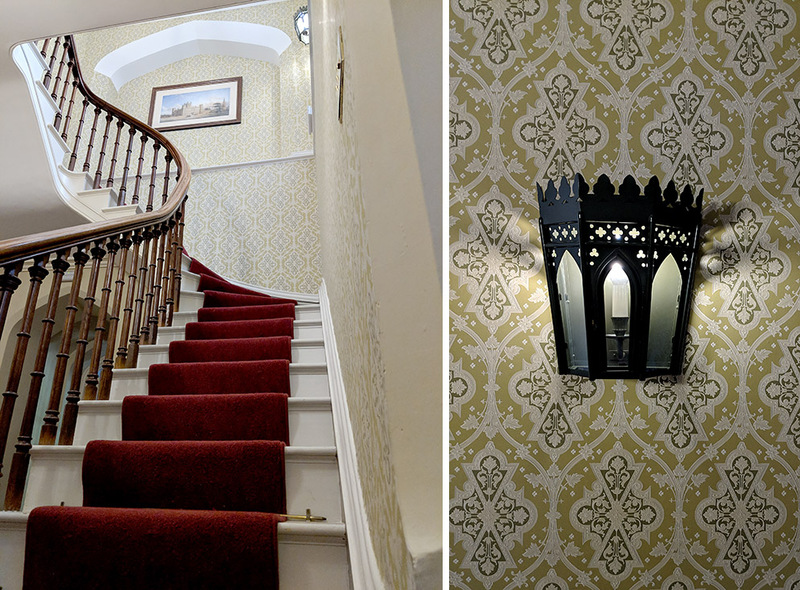 To see the stairwell that was in the Downton Abbey PBS series, and were green and white, and a iron/wood railings, and now see the grandeur with soft wall paper, rugs and pictures it is a MASTERPIECE to say the least !! P.S. How are they doing with the MOVIE !!!! 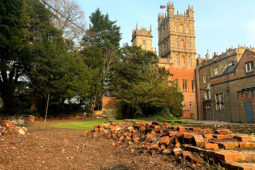 The movie is coming along famously John, it is so lovely to have the Downton family back at Highclere. What fun and mischief your are getting up to! I’m actually an interior designer and working on similar projects at the moment here in Scottsdale re: paint and my millwork craftsman Dave! My friend Rhonda is in the process of the last finishing touches of decorating her home & she is something of an artist herself; refinishing her dinning room ceiling in a beautiful metallic brush stroke finish! The effect is quite amazing in candle light! When I renovated my daughters bathroom (which had no window) I conviently left that little detail out with my husband and just had one installed over the shower. To this day I’m not sure he has ever realized it wasn’t originally there…. I truly appreciate the sheer scale of the restoration work you have been devoted to in preserving your home and truly enjoy seeing your progress! We are coming over on holiday to visit our family in Hertfordshire this May and my husband just confirmed our tickets to visit Highclere for my birthday present! Dreams do come true! As I’m reading this, I’m also listening to our contractor hammering away at our extra bathroom. The photographs on the wall are moving so much, I decided to remove them so I don’t have to sweep up glass later on in the day. Even though I’m in a suburb of Austin and not in the English countryside, I can’t wait to have those same feelings, that you’re having, when the project is complete. Thanks to Lydia Rudolph’s suggestion, I might even have a Kir Royale to celebrate. Thank you for sharing your home, your animals, and your adventures in Castle care with the rest of us. I recently toured the house. Luckily we were the last group to come through on the last day of the season. I thoroughly enjoyed it! I can not wait to be able to come back and see all the improvements that you are accomplishing. I enjoy keeping up with your blog and look forward to reading it every time. I feel like I am there when I read your stories. Thank you for including us in your daily life. It all looks beautiful and all that energy rising again so soon after “Heroes”! I’m about to embark on a redecoration of the annexe bedroom and bathroom we had built on for my mother, which in honour of Highclere I’m now going to rename “The Annie Stones” suite. No comparison to yours of course but I will be adopting the budget advice which I will probably extend to all personal and household expenditure in future. Thank you so much for the hint. I want to stay in the East Anglia bedroom!!! Hoping to come and visit next year. Keeping my fingers crossed! Love your hard work coming to fruition! It looks stunning and inviting at the same time. Beautiful work. I am curious on why it needed 7 different off-white colours? It is really a way to highlight the details of the carvings and mouldings – I hope you might notice the beauty of the room if you were to walk through it. Apart from the fact that I had mentioned it, the number of colours in the end does not matter! Thank you for another of my anticipated Monday Moments. Bless you all and strengthen your hearts as you tend to the care of Highclere, take delight in the spa treatments you’ve provided to sustain her! Dear Lady Carnarvon, I can’t wait to see the refurbished rooms! Very exciting. Here in the U.S., long ago, some rooms were painted a very pale pink in some of the large homes. Pink is very flattering to the complexion and very restful. So is pale green, a color often used in hospitals in the past. My mother would not paint our rooms with anything else but a very pale green until I persuaded her to paint my room a very pale purplish blue. My grandparents who built homes in the the very upscale Santa Anita area of California often used white and pastels on the interior rooms but never blue on the exterior. As I said, I look forward to seeing the new rooms. I think pale greens can be very pretty and Arundel bedroom on the opposite corner to East Anglia is a pretty pink – but not too feminine – Highclere is a string masculine splendid house! Dear Lady Carnarvon, one day I will get to visit your beautiful home.Love your blogs too. CHAMPAGNE MYLADY CHAMPAGNE! ! WHAT A GOOD IDEA. THE SPRING ARRIVED IN BRAZIL, THE AIR HAS CHANGED IT’S PRETTY HOT AND DRY 33 DEGREES CELSIUS. TODAY WITH GLORIOUS SUNSHINE IT IS SO LOVELY LOVELY THE DOWNTON FAMILY BACK AT HIGHCLERE CASTLE HOW WONDERFUL! ! ! ! CONGRATULATIONS ON THE RESTORATION AND BEAUTIFUL PAINT . I visited the castle in August 2017 and loved everything about the house and grounds. Reading your blog makes me feel like I am back there! I do so hope to return again one day! You never cease to make me laugh with your posts. The wallpaper is spot on and I do agree with your keen approach regarding projects and budgets. If everyone thought like that imagine how much more can get accomplished . Thank you for my weekly belly laugh. I will try to photograph some of the elements!!! My old labrador is ok and does not wake me – at the moment….. Sometimes she makes it upstairs at night but tonight I think not! I am so happy that you are a “traditionalist” in the sense that you prefer the bedroom colors to be soothing as well as aesthetically pleasing to whomever may happen to occupy it, be it only for a night or as visitors see a glimpse, they walk away with a feeling, that it is a beautiful and peaceful space. I am all into shades of off-white myself. My house is painted in shades of off white on the inside, and I just love it. No statement wall(s) in my house! By the way, I read in a Danish paper that a date has been set for the release of the new Downton movie. Is this correct or not, and are they referring to the one you are involved with? They have announced a release date of next September! I always look forward to the Monday blogs. In May of 2015 my husband and I and six of our dearest friends took a tour of Highclere during a week long holiday in nearby National Trust cottages. The day is often a topic of conversation. Every Monday I forward your blog and we reminisce about our visit and the impression it made on us. A few months later we had an English themed dinner and dressed in more formal attire than we usually do! My husband and I are returning to England in a few weeks and have made reservations for the tour on October 13. Needless to say, I cannot wait and after reading your blogs so often I will visit with new perspectives. 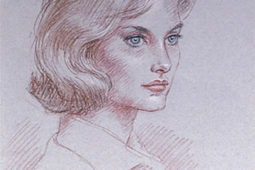 Thank you for your descriptive and entertaining stories about you and Highclere. I hope I will be here – so I look forward to seeing you and the tour will take you through East Anglia bedroom! I enjoyed this post so much! Decorating and design is a love of mine. I can just close my eyes and picture the different colors you mentioned. I love the fact that you enhanced the beautiful millwork with 7 colors. I hope to get to see it on our next visit! Your words have ‘painted a clear picture’ for us to visualize! I look forward to Mondays now that I can read your blog and have a cup of tea! It starts the week on a high note. Thank you! I am not sure Pat was very happy with the seven colours!! Delightful as always! I just left your fair and green land, is it already. Keep up the charming posts! The colors used in the Anglia bathroom are very soft and pretty. The staircase is very warm and bright. You can see the light from below as you look up. The most peaceful thing is how the light filters through the Castle and the care of your team. Thank you! Pat and her team do care, sometimes I am not sure why we are doing something but I know what we are doing. I would love to see before and after pictures, especially of the fixtures that hadn’t been touched in 100 years! It would be fascinating to see! Again, thank you for your lovely Blogs. Tell me about the Movie. I think the new room is lovely like Champaigne. The neutral colors, created an elegant serene, restful environment for for your guests. What types of art will you rehanging. PLEASE, TELL ME ABOUT THE MOVIE DOWNTON ABBEY. Lovely! The before/after would be great! The rooms look so fresh who wouldn’t want to wake with a headache? We are rehanging the curtains – but I have mislaid some paintings so i must go on a treasure hunt this weekend. They are probably stacked in a cupboard but I wish I knew where!! That is such an impressive project and you have done (and are continuing to do) a wonderful job. And what a wonderful experience for all who are involved in this work. Their hands are literally touching history. Unfortunately, it subsequently became doubtful as to whether we will be able to travel to England next year. Hence, after being out-bid on each item, I attempted to contribute by way of a donation through the website, as advised by the auctioneer. However, that too was unsuccessful. In lieu thereof, I have ended up being able to give a donation to “Legacy” in Sydney. 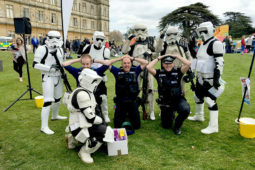 All in the same spirit as your wonderful “Heroes of Highclere”. Legacy week in Sydney occurred between 2-8 September. Sydney Legacy also is a founding partner of the “Invictus Games Sydney”, that will take place here between 20 and 27 October. Best wishes with the rest of this current project and the many other projects that you undertake with respect to your magnificent home and estate. Beautiful post; thank you! But now I’m curious…why were green and cream the only paint colors that were produced en masse after World War II? I am not quite sure – I have not really investigated why those colours were possible! It remained a time of rationing, so much was in short supply. Absolutely delightful blog, which did not, sadly, land in my Inbox this week, so my brother sent it to me just now. I agree with a previous “commentor” who lovingly endorsed your “traditionalist” style, creating such soothing peace in your guest bedrooms. And your discussion of the project “budget” that doesn’t actually exist makes me laugh out loud, reminding me of a hilarious conversation in a very old movie called, “Life With Father,” starring Irene Dunne and William Powell. I realize budgets are practical things–but rarely are our expectations met. thus, there is no disappointment! Love hearing from you every week. Love keeping up with “The House” and you and your family! Admittedly, I was not formally aware of Highclere Castle until I became a ‘Downton Abbey’ fan. That said, I am more thrilled with the true history of your home more so than the fictionalized version. I love the choices of paint colours and the treatment of the staircase. It restores an element of elegance & grandeur to the rooms. Kudos to you, Pat, Sarah, and the entire Team working on this project. I hope, one day, to visit Highclere in person & revel in its majesty. It looks so nice the staircase, very luminous! I love decorating!